What is it with guys in #23 jerseys breaking Cavs fans’ hearts? As counterintuitive as this sounds, the Cavs should simply retire LeBron James’ #23, if for no other reason than to move one step closer to having it removed altogether from the NBA. For their first two decades, the Cleveland Cavaliers, with the help of criminally incompetent owner Ted Stepien, were among the NBA’s bottom-dwellers, having won more than 43 games in a season just once. In many ways, the last two decades (22 years actually) have been kinder to the Cavs, with 11 seasons of 47+ wins, seven seasons of 50+ wins, two 60-win seasons, and the franchise’s only trip to the NBA Finals. However, for various reasons - most involving serious injury or some dude in a #23 jersey, even the best of seasons have ended in heartbreak. In the deciding game of Round 1 of the 1989 playoffs, Michael Jordan hit “The Shot." In the 1993 Eastern Conference Finals, Michael hit “The Shot: Part II." The franchise won the lottery (literally) in 2003, and with it the right to draft local prodigy LeBron James, only to have its best-ever run end in tears, as their local hero chose not to make good but to seek greener pastures elsewhere, but only after publicly toying with the only professional franchise he’d ever known. Is Cleveland cursed? Probably not. Really unlucky? Definitely. On the ropes? For the time being. Is there hope? Always. Lenny Wilkens put up better numbers (18.5 ppg, 7.7 apg) in 149 games at the end of his Hall-of-Fame career, but Mark Price is undoubtedly the face of the Cavs at the point. Price, one of the underrated backcourt players of his era, put up comparable numbers while playing more games with the Cavs than any other backcourt player. A dozen years after his retirement, Price remains one of the NBA’s best-ever shooters- despite missing over 20% of his games- and is the Cavs’ all-time leader in assists (4,206) and 3-pointers made (802). More than individual numbers, however, Price contribution to the Cavs’ first period of team success. Through the 1988-89 season, Price’s second as a starter, the Cavaliers had won more than 43 games in a season just once (49 in 1975-76). 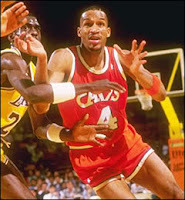 In his six full seasons as a starter (Price missed 66 games in 1990-91), the Cavs won 47+ games four times and 50+ three times, including 57 wins apiece in 1988-89 and 1991-92. In addition to Wilkens and Price, Andre Miller (14.5 ppg, 8.2 apg in 245 games) and Terrell Brandon (12.7 ppg, 4.9 apg in 457 games) put up some decent numbers in Cleveland at the start of their respective careers. Before he was winning championships alongside Michael Jordan, Harper was an explosive high-flyer in the MJ mold. This is a position with some talent at the top, but doesn’t feature much depth or longevity with the franchise. In three seasons with the Cavs, Harper enjoyed a pair of outstanding all-around seasons (1986-87 and 1988-89), but missed 25 games in 1987-88 due to injury. Prior to being traded to the Clippers for the draft rights to Danny Ferry, Harper combined with Mark Price, Brad Daugherty and Larry Nance to form the NBA’s best young unit of the late 1980s. Sadly, thanks to trades, injury and a certain “Shot” in the 1988-89 playoffs, this group would never get to maximize its potential. Also worth noting is World B. Free, who put up some big scoring numbers (23 ppg, 1.9 rpg, 3.9 apg in 275 games) for the Cavs in the early- to mid-80s, but played for teams than won 23, 28, 36 and 29 games. Though Harper’s scoring fell short of World B.’s, Harper enjoyed some team success, was a better shooter from the field (47.4%, v. 45.4% for Free) and put up far better all-around numbers. Huh. Awkward. Man, this would have been so much easier a month ago! For all the recent abuse he’s received for his clumsy exit from Cleveland, the fact remains that LeBron is an absolute force of nature. Irrespective of how the past few weeks played out, in judging LeBron James the player, it’s important to remember that he entered the league at 18 years of age, with as much hype as any incoming player in history, and for seven years (feels like so much longer) did not disappoint. LeBron’s the best scorer, rebounder and passer in Cavs’ history, and managed to accomplish virtually all there is to accomplish in his time in Cleveland. Individually, he was named the 2004 Rookie of the Year award, was named league MVP each of the past two seasons, was selected to six All-Star teams (MVP twice), All-NBA 1st Team four times (2nd team twice), All-Defensive 1st Team twice and won the 2008 scoring title. Smash-cut to July 1: As one of the most sought-after free agents in NBA history, LeBron staged a series of contrived meetings in Akron, before announcing his departure in an hour-long special- which he effectively co-hosted. However, the fact remains that, although know the wounds are still fresh, LBJ will be an all-timer. But while he may play some great ball and win some rings in South Beach, remember this Cavs fans… you got the best of him. Power forward for the Cavaliers is surprisingly deep position, packed with “hard hat” guys, as well as some guys that put up some more impressive stats. In the former category we find the likes of Tyrone Hill (10.8 ppg, 9.2 rpg in 303 games), Drew Gooden (11.9- 8.6 in 292 games), Hot Rod Williams (12.9- 7.1 in 661 games) and Anderson Varejao (6.6- 6.4 in 311 games, and counting). On the other hand we have Cliff Robinson (not the ex-Blazers SF with the headbands), who played for a trio of atrocious Cavs’ teams in the early 1980s- 51 combined wins in his two full seasons, and played 30 games for the 15-win 1981-82 team- put up a 17.7- 10.5 in a classic “looter in a riot” situation. The Cavs’ leader in scoring average from the PF spot is Shawn Kemp, who was the team’s top player in the late 1990s, averaging 18.5 ppg and 9.1 rpg in three seasons. 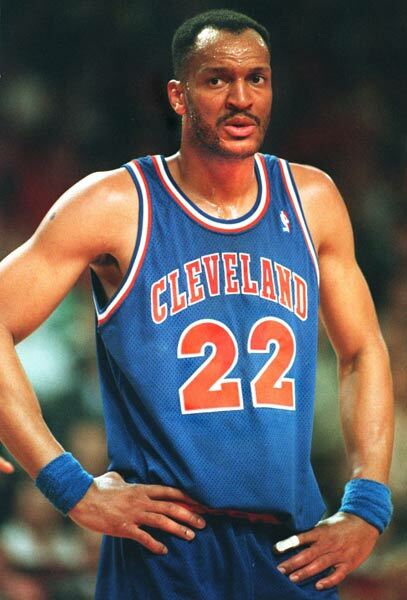 But Larry Nance, who featured for the Cavs’ solid early 90s teams, was the best of the bunch. Nance was blessed with incredible length and a soft touch, both around the basket (53% FG) and from the line (80.4% FT). 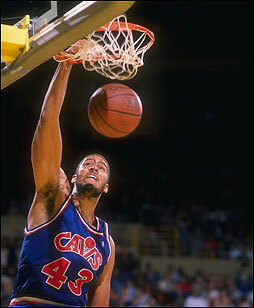 Sharing the frontcourt with the Brad Daugherty, Nance was also a solid rebounder and an outstanding shot-blocker. Though not quite as bad as the hard luck faced by the Portland Trailblazers, the center spot for the Cavaliers is defined by a pair of gifted big men- Brad Daugherty and Zydrunas Ilgauskas- that were hard-hit by injuries. The nod here goes to Daugherty, #1 overall pick in the 1987 draft and anchor of the best non-LeBron teams in franchise history, including a pair of 57-win squads. Had he stayed healthy, he would have built a strong Hall of Fame resume. 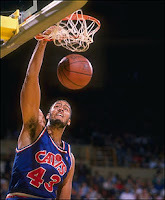 As things played out, Daugherty spent eight seasons with the Cavs, playing 70+ games six times, averaged 20- 10 for three consecutive seasons (1990-91- 1992-93) and was selected to five All-Star teams. Sadly, chronic back problems kept Daugherty, then 28, from playing in the NBA after the 1993-94 season. His #43 was retired by the Cavaliers on March 1, 1997. In his ten seasons in Cleveland (missed the entire 1999-2000 season after playing just five games in 1998-99), Ilgauskas (13.8 ppg, 7.7 rpg in 771 games) also put up some solid numbers. When he was healthy (2002-03 through 2005-06), Ilgauskas was selected to a pair of All-Star teams and never averaged less than 15.3 ppg. Not one to do a whole lot of banging in the paint, Big Z could score in the post and hit the boards, but it’s his smooth shooting touch to about 18 feet (not bad for a guy 7’3”) that he was best known for. Ilgauskas did warrant some consideration here, but given Daugherty’s superior numbers and comparable team success, the decision wasn’t too difficult.